I'm Shelf-ish: Next O&W Train from Tennessee by JR Holbrook Book Blitz - Win a $25 Amazon Gift Card! 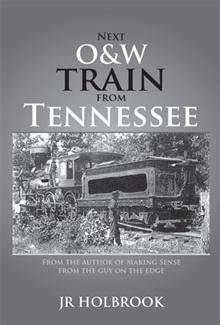 Next O&W Train from Tennessee by JR Holbrook Book Blitz - Win a $25 Amazon Gift Card! James Holbrook is the great-great-grandson of Nancy Moody. Nancy Moody was the daughter of Charlot Moody and Johnathon Moody-Johnathon Moody was killed in the Civil War-Nancy Moody being the mother of Armeldia Moody and the grandmother of Raymond Wright, Selby Wright, Clara, Cora, and Edith. This is the second short story of James Holbrook, who also published Making Sense in 2011. James graduated from Sullivan University in 2008 with honors and decided to try the option of writing some short stories and children's books. What James likes most about writing is creative expression. JR Holbrook has traveled to many places in his life and lived in more than just a few places over nearly fi fty years. While in Hawaii, he had many wonderful experiences, and some of these are in his book. He has been to the Grand Canyon, and saw eagles and condors fl y over its enormously high cliffs. When he traveled to Punta Cana and Costa Rica with college students, he had a great learning experience. He was amazed as he watched the water fall over the edge of Niagara Falls. He also enjoys writing and has studied it through the many years while being in college. He has served as a security offi cer for many years and has an interest in legal issues. Most of his family members from his father's side who lived in Prestonsburg, Kentucky, were medical doctors, and this is also in his book. Pump Up Your Book and JR are teaming up to give away a $25 Amazon Gift Card! This giveaway begins April 1 and ends on April 15. Winners will be contacted via email on April 16, 2014. The Soul of the Sun Book Blitz!